Equipped with notebooks for interviews and my camera for what I was sure would be my first and only Retreat & Refresh Stroke Camp, I turned onto that loooooong dusty, dirty road to reach this place called Livings Springs, hidden off the state road in Lewistown, IL, in June 2008. Marylee Nunley and some other folks were there to greet me as I donned my name badge and offered my assistance as a weekend volunteer. Marylee introduced me to her husband, John, who had survived his September 2001 stroke and was a friendly greeter. I found myself observing more than interacting, but that was okay. I was still rather shy and felt much more comfortable listening and shooting photos. 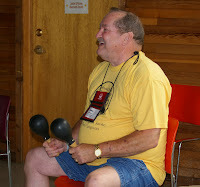 The first gathering was the drum circle, in which campers — stroke survivors and their caregivers — joined the volunteers. 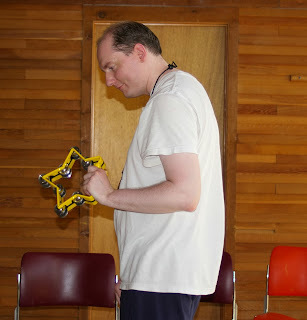 Susan Bock, the music therapist, tried to coax me to take an instrument and sit in the circle, but I politely said I’d like to take photos from the outer rim and learn while watching. from a young married couple to a mother accompanying her adult son who suffered a stroke after being shot in the head. If I had seen most of these individuals while walking down the street, I would have never known they were survivors or caregivers. And each survivor faced different challenges, from physical deficits such as limited use of one side of their body to the inability to speak more than a few words. The first clear message I heard was “once you’ve seen a stroke, you’ve only seen one stroke,” which I quickly absorbed and committed to memory. And the second immediate lesson was that the simplest things in life are truly the most important … laughter, love, tears, holding hands, hugs, being oneself. 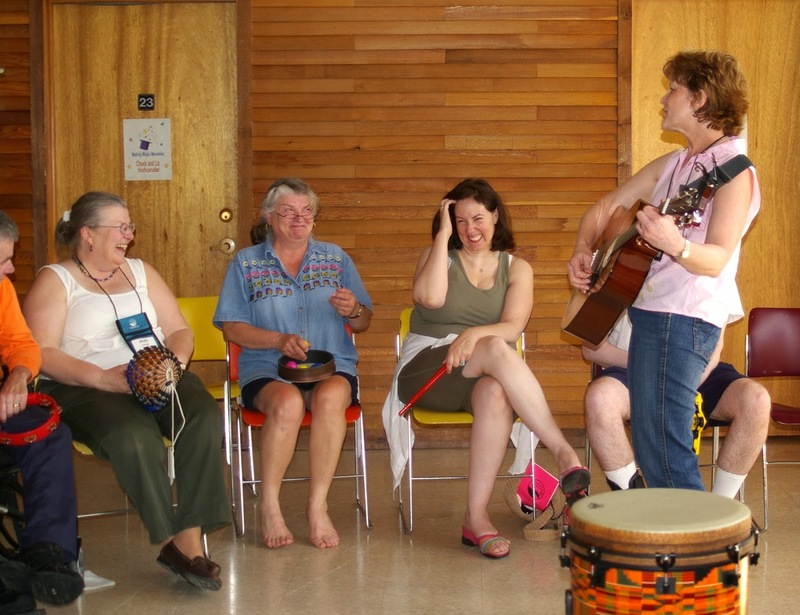 Marylee was definitely the hostess with the mostest as she made everyone feel at home in this main building that housed the individual sleeping and bathrooms for campers, and each opened into the main activity and dining room area. Caregivers could sit in the main area and talk with other campers and volunteers while keeping a close eye on a sleeping survivor. What a perfect arrangement. I loved it. Boy, Was I Ever Wrong - Monica. When I decided in 2008 to write a book on coping with stroke, several people told me I HAD to talk to some gal named Marylee Nunley. I had no idea who she was. When Retreat & Refresh Stroke Camp executive director Marylee Nunley answered her phone in April 2008, she had no idea who I was. I identified myself as also being from Peoria and the author of a new book on coping with Alzheimer’s and co-author of an earlier volume on cancer. Now I wanted to write about stroke. Oh, and I wrote Peoria history books. When I showed up at her house a week or so later, I immediately noticed a photo on the entryway wall. Marylee and I had a connection … other than both being short in stature. We had been honored in 2005 at a local event that recognized 25 women in leadership and were in the group photo. And on the magazine cover, my photo was below hers in the block of mini images. But we hadn’t actually met. As we sat at her dining room table, I explained that I was focusing on brain-related topics for my book series, “Help Me Cope & Survive!” After working on the Alzheimer’s book for three years, I felt this “calling” to work on brain injuries, illnesses and diseases because brain topics often make people uneasy. Many equate any “abnormal” behavior to mental illness and shy away from people acting or speaking strangely. I had learned so much while working on the Alzheimer’s book that I wanted to address stroke, brain injuries, and brain tumors-brain cancer, all together in the next volume. Marylee taught me more that day about stroke than I would have ever discovered in a typical classroom. Nope, I knew immediately that stroke had to be its own volume, as did the other topics. Her husband, John, had had a stroke in September 2001, and she was his caregiver. Marylee’s family knew more about stroke than 99.9 percent of the population as her brother’s wife, Meme, had had a stroke just two months earlier in February 2008. After she briefly educated me on stroke, I asked her about this “stroke camp” I had heard about and why a number of folks had recommended I talk to her. With the enthusiasm of a mother talking about her newborn, Marylee told me about camp, a weekend experience for stroke survivors and their immediate caregivers. Hmm, I wasn’t the camping kind, but I’d love to talk to those who came to camp. I asked if I could attend for the day. She said I could come as a volunteer at the first camp of the season in early June about 50 minutes from Peoria in Lewistown and talk to campers. Yeah, I had heard of Lewistown, but not this Living Springs campgrounds she talked about. Volunteer? Sure, why not. I had experience working with folks in my service organization. I filled out the form. After thanking Marylee for her assistance, I headed home and put that date on my calendar. Sure, I could give up some time in June to get a bunch of interviews. Then I’d keep moving on with my research. Starting Christmas Eve I will begin posting a series of articles written by Monica Vest Wheeler. 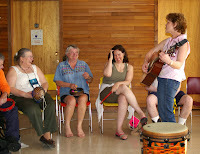 As many of you know, Monica is very active with our stroke camp and with Alzheimers sufferers. 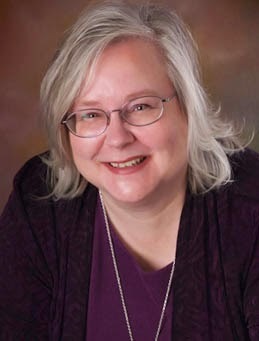 She is also an accomplished writer with several books in publication. I am personally excited to see what she has to say in the upcoming weeks. I would also like to get offerings and ideas from the rest of you that I can interleave with Monica's future articles. This blog has been in operation since December 2011. There have been 110 articles posted in that time and a page view count of over 17,600. As blog moderator I have run out of ideas as to what to post next. What would you like to see or see more of? You can respond here by Comment or go to our Contacts link and use one of the contact methods listed there to submit your ideas. Thank you for your readership this far and I hope we can continue with some thought provoking and interesting articles. There are very few products I would care to promote on this blog but this product is one I think is very beneficial to stroke survivors having problems with speech. We have demonstrated Bungalow's speech software at some of our camps and, Marylee, our camp Executive Director, speaks highly of it. She has used it with her husband John, who experienced a stroke in 2001. John started using several of the Bungalow modules daily in 2003 and Marylee saw dramatic improvement in his speech over the following two years. He went from barely speaking one word "sentences" to being able to carry on conversations in public. I have mentioned this product in this blog before but I think it bears repeating. Proven, effective speech therapy software. Use independently or with a speech therapist. Between the speech therapists and the Bungalow Software, my husband John is doing so well that he is able to communicate his wants and needs by speech. The speech therapists said that your aphasia therapy software has helped John progress to this level of speech." Former Clinic Supervisor, Portland State Speech and Science Program. I teach at a University and love the concept of your company. Therapy is so much more effective when clients can follow through with it at home. "Bungalow is a wonderful addition and supplement to our field, and a wonderful resource for our clients." Use this therapist-designed speech-therapy software for unlimited, independent speech & language practice using proven therapeutic techniques for faster rehabilitation. These programs have been trusted by over 20,000 stroke survivors and used in over 2,000 speech therapy clinics. Many stroke and brain-injury survivors don’t get enough insurance provided therapy for a full recovery and can’t afford additional therapy. Without ongoing therapy practice (such as with the Bungalow Software programs) patients often do not improve, and they may worsen, as shown in this graph of the results of aclinical study of aphasia software.Clinical studies show that software-based treatment can speed recovery enormously by providing the practice and repetition that researchers agree helps recovery. Bungalow Software has helped people up to 20 years after their brain-injury. Less frustration. More effective therapy. If you need help figuring out which programs are most appropriate, contact us or use the onlineTherapy Advisor. We're happy to help. Bungalow Software creates and sells software for Speech & Language therapy. It was started in 1995 by Clay Nichols & Terri Brancewicz. Most of the programs on this website were developed by Clay and Terri. Terri, a speech pathologist, wanted programs for her patients to use independently at home for home speech therapy practice. She turned to Clay who created the programs. And then she asked for more. And more. Today, Bungalow serves thousands of customers around the world and has distributors in the USA, Europe, and Australia. Read more >>Bungalow has been featured in the Stroke Connection magazine and on the national and regional newsand has presented seminars at the national ASHA Speech-Language Pathology conferences. E-mail Bungalow with questions or comments. We answer all emails, usually within 1 business day. If you have not received an answer within one business day, please double check that you don't have any spam filters installed that would block our messages to you. Mon-Fri 10am to 6pm ET. Closed for all major US Holiday and all Postal Holidays. Once a Caregiver……and so Care Partners Resource was born. I want to thank each and every one of you who voted for us on Facebook during the office makeover contest conducted by RK Dixon a market leader when it comes to copiers, printers, IT services and pure drinking water systems. We didn't win the $15,000 office makeover prize but, as a result of your efforts, the camp is a winner of a much needed $1,000 printer. The following was published in the October/November RRSC NewsLetter. I'm reproducing it here for those of you who are not getting our newsletter. Feel free to click on any of Lori's links. They lead to some very helpful web sites. You know the old saying “once a … Always a … “ I have found that to be true of the Caregivers I have met since I was introduced to the term 12 years ago. My mother survived a stroke which left her paralyzed on her right side and an expressive aphasic. All terms I had not heard before July 20, 2001. But after caring for her for eight years they now flow from my tongue like any other caregiver who has taken an active role in the recovery of a loved one. The moment I got the call my life and vocabulary were forever changed. (http://www.stroke.org/site/PageServer?pagename=careliving_guide) and helped start an online support group (http://careliving.stroke.org/) where caregivers help each other find resources or simply express their feelings so they are not isolated and alone. 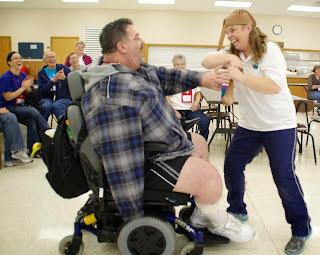 Another way I try to make a difference is by volunteering at Stroke Camp. Marylee and John and everyone from Refresh & Retreat Stroke Camp are another example of taking the Stroke experience and turning it into a positive way to change the world. If you have gone to camp you know exactly what I mean and if you have not yet had the opportunity I hope to meet you at a camp next year. though I wish I could. That is where our band of volunteers step in and execute camp weekends with professionalism, love, and dedication. It is a privilege for all of us to spend these weekends hearing stories of recovery, progress, accomplishments, and yes, frustrations and setbacks. Our campers have given me a rich knowledge of so many things that I otherwise wouldn’t know. It is my hope that everyone reading this, no matter what’s going on in your life, will take the time to focus on the good things and be thankful. And now read on and enjoy some things that our campers had to say this year! 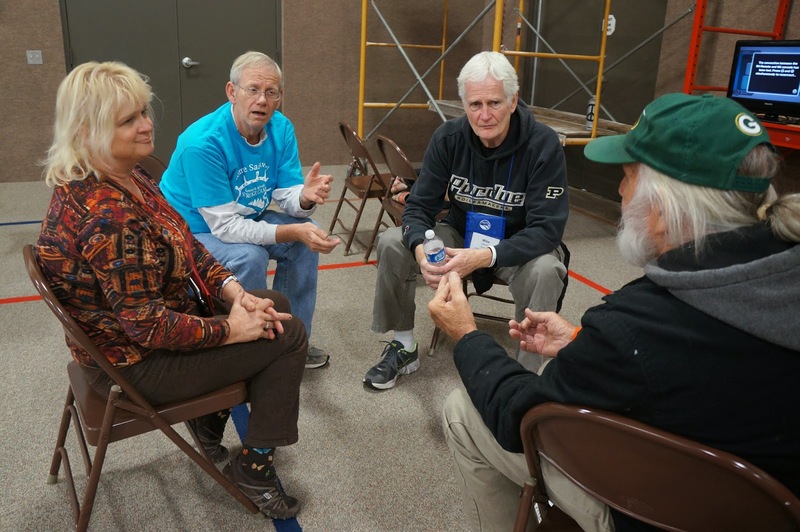 "It was a very uplifting experience for us." volunteers and staff were to me!" help stroke survivors. They are angels." "We had a great time all weekend. We were so glad we went. Thank you so much for caring about us!" everyone who worked to put this together." could add the word “vital” to your list of adjectives. -- Thank you we had such a great time! It helped us look more easily into the future of our recovery." 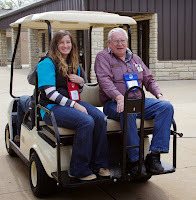 "It was a wonderful, educational, entertaining and inspirational experience. Best weekend I have had post stroke." problems and just have fun." "It was extraordinary far reaching and beyond!" "We had an outstanding time. We tell everybody about the camp. Will come back next year. Thanks so much." "We didn’t know what to expect, but it was better than anticipated. It was a really great experience." "Thank you-we had such a great time! It helped us look more easily into the future of our recovery."